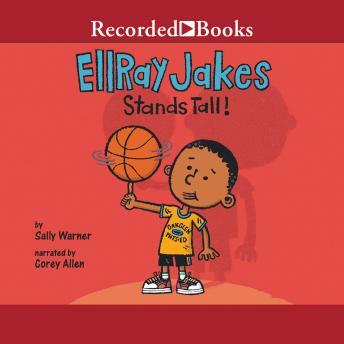 EllRay Jakes finally grows up (a little) by playing basketball in this ninth book in the series. There's a new game in town: basketball! Or in EllRay's case, "pre"-basketball. Coach Havens has all the third graders dribbling, passing, and shooting, and he's quick to compliment EllRay's skills. No one else seems to notice them, however, and as 'the shortest kid in the class,' EllRay is still chosen last for teams at recess. What's a short guy gotta do to get noticed? When EllRay comes up with a plan that involves the off-limits teacher's lounge, "everyone" does a double take!